As Cetera names winners of its Business Plan Challenge, CEO Larry Roth says "there's been no conversation around selling" the BD group. 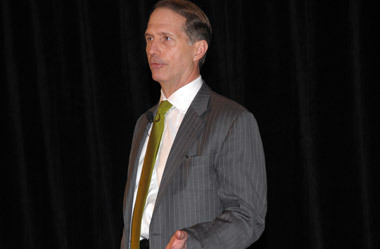 Larry Roth heads the Cetera Financial Group. The head of Cetera Financial Group, a group of independent broker-dealers owned by RCS Capital (RCAP), says the firm isn’t likely to sold or spun off any time soon and is focusing on day-to-day operations. After sister firm American Realty Capital Properties (ARCP) revealed $23 million of accounting errors in late October and RCAP pulled out of a deal to buy part of Cole Capital from ARCP in early November, executives made it clear they were considering all options on a call with investment analysts about two weeks ago. “There’s been no conversation around selling [Cetera],” said Cetera President Larry Roth, in an interview with ThinkAdvisor. Cetera said early Tuesday that it had picked 61 affiliated advisors to receive a total of $6.7 million as part of its Business Plan Challenge program. The awards aim to help the winning advisors move aggressively to implement growth plans. According to Cetera, which includes 11 broker-dealers and about 9,700 reps, the broker-dealers fund the plans with support from RCS Capital and Cetera. Independent advisors and advisor groups submitted close to 400 applications for the challenge grants, according to Cetera. Cetera shared news of the Business Plan Program with advisors in June. “Advisors were excited and see it as the best way to grow,” the Cetera executive said. Those who didn’t receive a grant can rewrite their business plans, and we will continue to see how to best support them,” said Roth. McKinley Financial, which is based in Redwood Shores, California, put together a plan “essentially involving the community in the heart of Silicon Valley,” Connor explained. Over years, he says, McKinley Financial — like many others — has pushed to make business improvements and grow by, say, 5% by doing more of the same or cutting costs, he says. — Check out Realty Capital Says Cetera Spinoff ‘On the Table’ on ThinkAdvisor.